The inspiration for my creation was this beautiful card by Lynn on Pinterest. I liked the central butterfly image and the colored square layered on an embossed piece of whisper white card stock, so I started with those, but chose to incorporate more Daffodil Delight in my design. I love bright yellow, whether it’s in my garden, on a card, or on my kitchen walls! The butterfly was stamped in Night of Navy on a 2-1/2 inch square of whisper white cardstock. After stamping, the image was colored with Daffodil Delight and an aqua painter. A Daffodil Delight marker was used to emphasize the patterrn on the butterfly. Then the edges of the square were sponged in Night of Navy to help them stand out from the white embossed layer. The Make a Wish stamp from the Perfect Pennants set was also stamped in Night of Navy, then mounted on a square of Night of Navy. 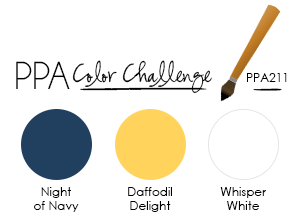 To balance out all the Navy, a yellow ribbon was added and the ‘A’ in Make a Wish was stamped in Daffodil Delight and punched out with the 1/2″ circle punch, then popped up with a Dimensional. Hope you enjoy my creation and that you have time to play today! Happy Stamping! Pals Paper Arts Challenge, Papillon Potpourri, Perfect Pennants. Bookmark. 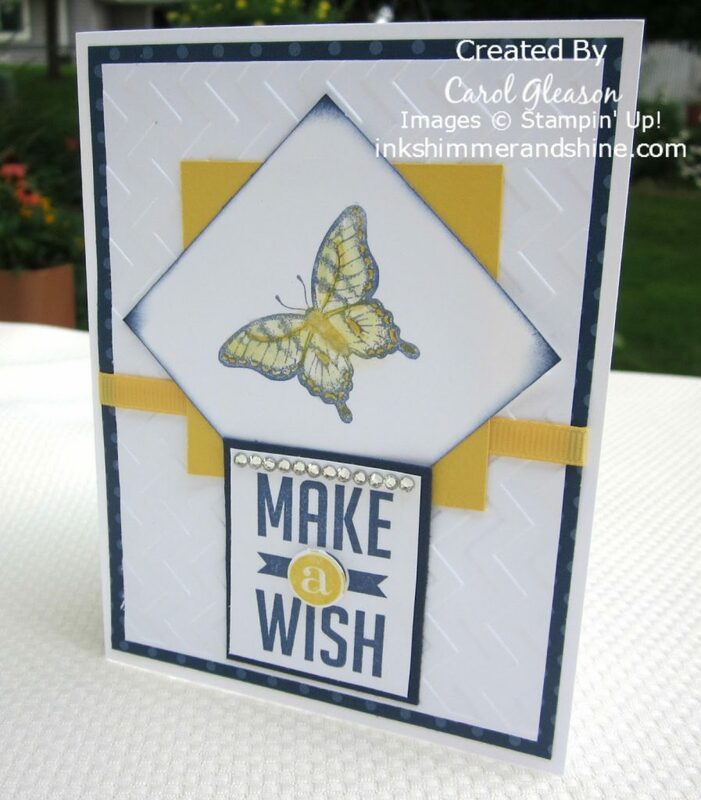 The sponging on the corners of the butterfly panel just makes that card POP! Thanks for joining us at Pals Paper Arts this week. Carol – Same comment as Diane – the sponging on these corners is brilliant! Thanks for playing along with the PPA challenge this week.